Manchester City returned to the top of the Premier League table with a statement thrashing of Chelsea at the Etihad. Pep Guardiola’s team have made a habit of flying out of the blocks in recent weeks, and they were at it again when Raheem Sterling opened the scoring within four minutes. Few expected what followed, however, as Chelsea fell apart in the face of a light blue onslaught. Having missed an absolute sitter moments earlier, Sergio Aguero then rifled in a pearler from 20 yards. The little Argentinian capitalised on a Ross Barkley error to score his second moments later, eventually completing his 11th Premier League hat-trick – to tie Alan Shearer’s all-time record – from the penalty spot in the second half. Ilkay Gundogan also chipped in, with Sterling completing the rout with 10 minutes left. City are top of the table on goal difference; Chelsea, chastened, drop to a season-low sixth. Pep Guardiola set Manchester City set up in a 4-1-4-1 formation, with Raheem Sterling, Ilkay Gundogan, Kevin De Bruyne and Bernardo Silva operating behind Sergio Aguero in attack. As the final scoreline suggests, the hosts had significant success in breaking through Chelsea’s high press, consistently finding free men to bypass the pressure and advance the attack. The progression depended on how Chelsea pressed. For example, when Gonzalo Higuain and one of Ross Barkley or N’Golo Kante pressed City centre-backs Aymeric Laporte and John Stones, the hosts would create a four-on-two diamond, featuring Ederson at the base and a free Fernandinho at the tip, to bypass the press, turn and advance. 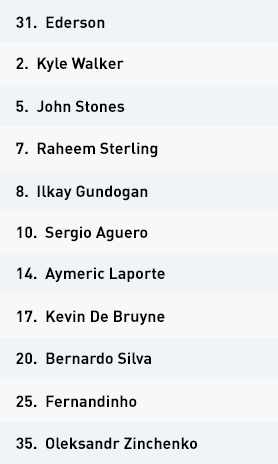 If Fernandinho was being marked, and both Eden Hazard and Pedro were covering full-backs Kyle Walker and Oleksandr Zinchenko, then one of Stones or Laporte would look to play directly to Kevin De Bruyne or Ilkay Gundogan in midfield. 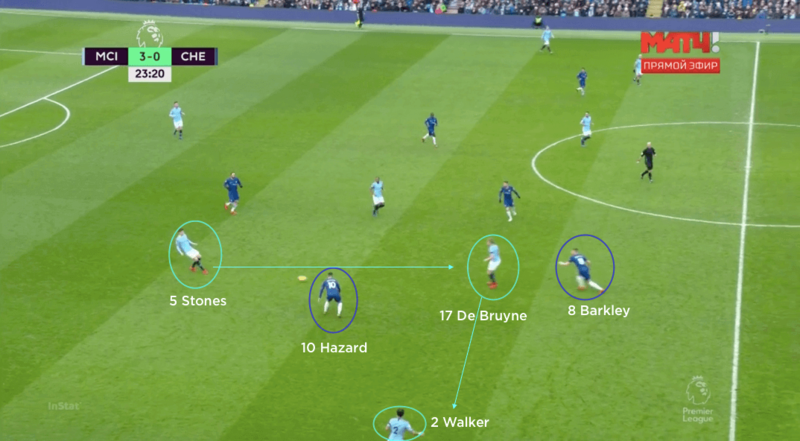 If Hazard and Pedro pressed inside, then City would bounce the ball out wide to whichever full-back was now the free man – he would then have room to advance, with Sterling and Bernardo Silva positioned high enough to keep the Chelsea full-backs busy. 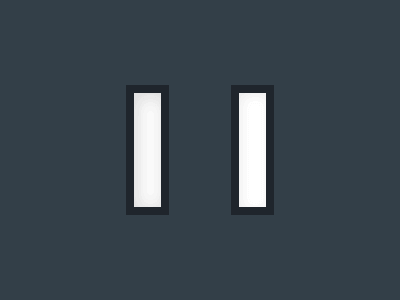 No matter how the visitors chose to press, the hosts found a way of moving around them. 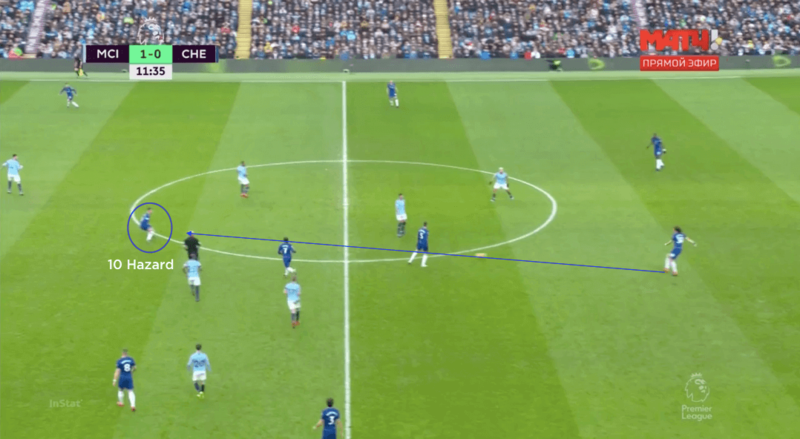 Further up the pitch, Aguero often started in an offside position on the blind side of the Chelsea back line, before then dropping to receive to feet between the lines. This reduced the time the defenders had to react and track him, leaving Aguero with more opportunity to turn or combine with De Bruyne or Gundogan. 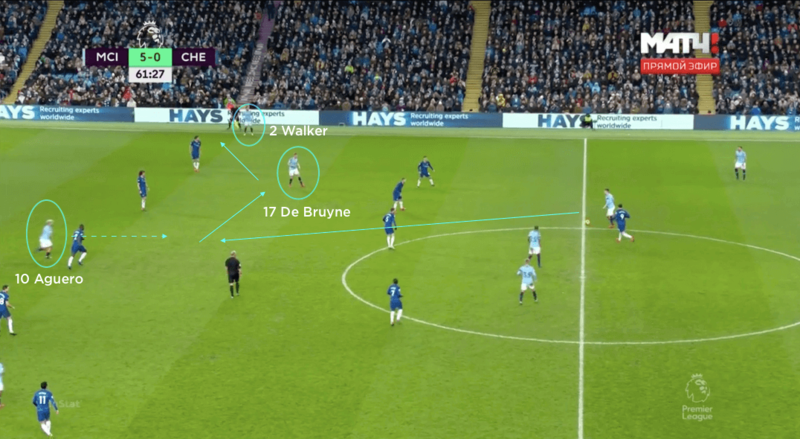 Once the ball was in the half-space with one of their two attacking midfielders, City would look to their wide attackers or full-backs to run in behind the Chelsea full-backs and play low passes across Chelsea’s goal. 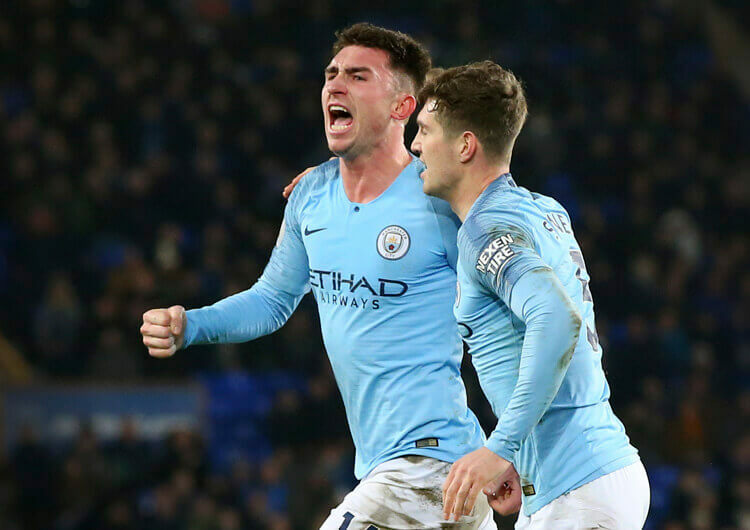 The hosts created a significant number of chances in this way, even after Gabriel Jesus replaced hat-trick hero Aguero as the central forward on 65 minutes – including the sixth and final goal in the rout, with Sterling tapping home from Zinchenko’s left-sided cross. Off the ball, Guardiola’s men pressed in a 4-1-4-1 structure, but were particularly aggressive at Chelsea goal-kicks. If the visitors built down the City left, then Sterling would press Antonio Rudiger; Zinchenko would leave Pedro to press Cesar Azpilicueta, with Laporte moving over to mark Pedro and opposite full-back Kyle Walker staying back. On the other side, Bernardo Silva would press David Luiz, leaving Walker to push up on to Marcos Alonso, Stones to deal with Eden Hazard and Zinchenko staying back on the left. 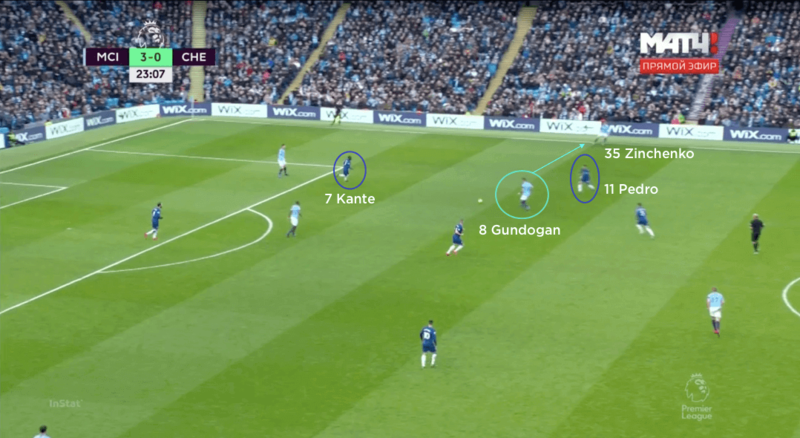 In the middle, Gundogan and De Bruyne marked Kante and Barkley, while Aguero locked on to Jorginho but was always ready to press Kepa if the ball worked its way back to the Chelsea keeper. 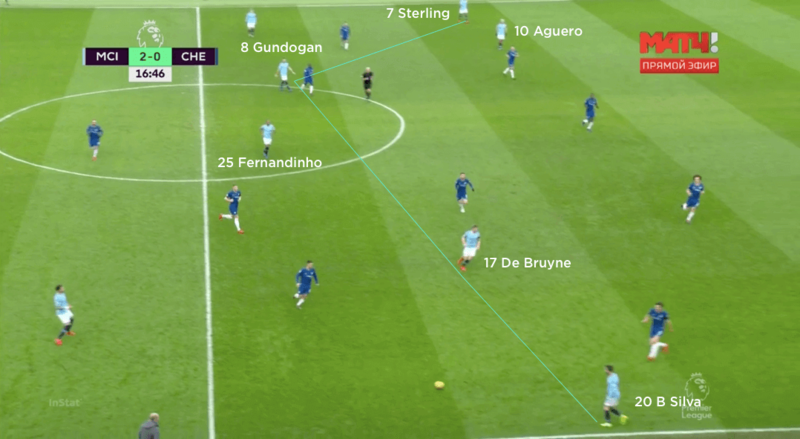 If Chelsea had good possession, City would release Gundogan or De Bruyne to press the second centre-back so Aguero didn’t have to chase between the two, while Fernandinho would move up to cover the man being left free. 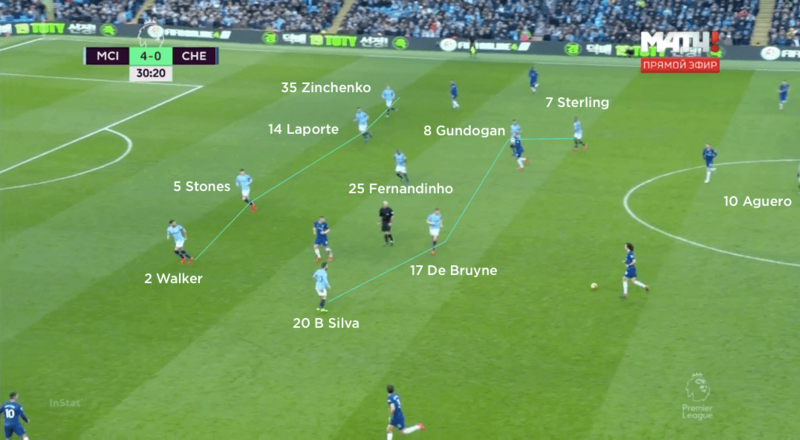 Part of City’s defensive success was also a result of Bernardo Silva and Sterling’s willingness and ability to track the Chelsea full-backs, which allowed their own full-backs to go and engage if Chelsea were threatening in wide areas. They were also quick to move inside and cover Kante or Barkley as and when their inside midfielders moved higher in the press. 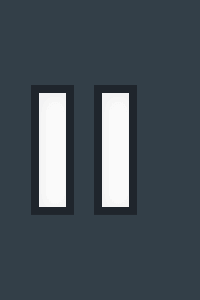 Manchester City used a 4-1-4-1 formation in possession. Raheem Sterling, Ilkay Gundogan, Kevin De Bruyne and Bernardo Silva operated as an attacking midfield four behind Sergio Aguero. Out of possession, City pressed high or used a 4-1-4-1 mid-block. Fernandinho sat in his usual position between the midfield and defensive lines. When Chelsea pressed Aymeric Laporte, City played out on their left side through Gundogan and Oleksandr Zinchenko. When Chelsea dropped off, City mostly played out down their right side. John Stones travelled out with the ball, before looking for De Bruyne or Kyle Walker. 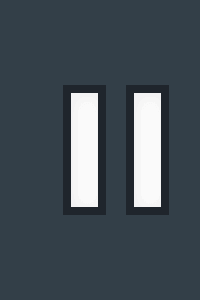 Aguero often started in an offside position, then dropped in between the lines to receive and combine with De Bruyne or Gundogan before the wall went wide. 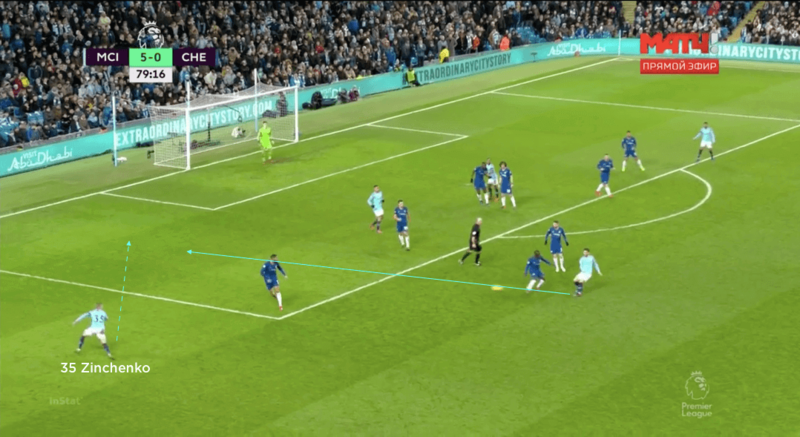 As is often the case, the hosts tried to exploit the area behind the opposition full-backs and put low balls across the Chelsea goal – as here, which led to Sterling scoring their sixth and final goal. Chelsea set up in a 4-3-3 formation in possession, with Jorginho at the base of the midfield. Eden Hazard and Pedro supported Gonzalo Higuain in attack. The visitors used a 4-1-4-1 out of possession, with Pedro and Hazard dropping into a midfield line of four alongside Ross Barkley and N’Golo Kante. The Blues mostly tried to play to Hazard between the lines, for him to receive and then turn and run or combine with attacking teammates. When he moved inside, Barkley would often move wider on the left. Chelsea tried to use short passes on one side of the pitch to draw Man City in, before switching to the other side. Here, the opposite side’s full-back and winger – in this case, Cesar Azpilicueta and Pedro on the right – would look to attack the weak side. 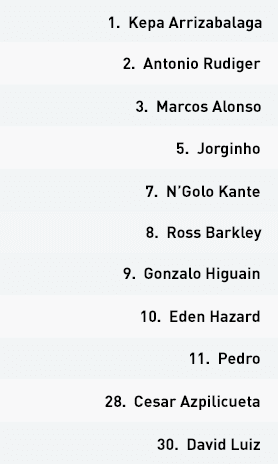 Maurizio Sarri set Chelsea up in a 4-3-3 structure, with Jorginho at the base of the midfield and N’Golo Kante and Ross Barkley ahead of him. Eden Hazard and Pedro supported Gonzalo Higuain from the wider areas in attack. The Blues looked to try and drop Hazard in between the lines and play directly to him from Jorginho or the centre-backs. As he received, he would try to turn and run at the City defence or release one of his wingers in behind to attack the wide areas. As the Belgian dropped in from the left, Barkley would often drift wider but deeper, allowing Marcos Alonso to move forward from left-back. Chelsea often circulated possession when City were in their mid-block, but had significant difficulties in playing through City’s high press. They regularly lost possession or sent passes out of play; even when they did manage to keep possession, they rarely looked in full control against their opponents’ intense pressure. 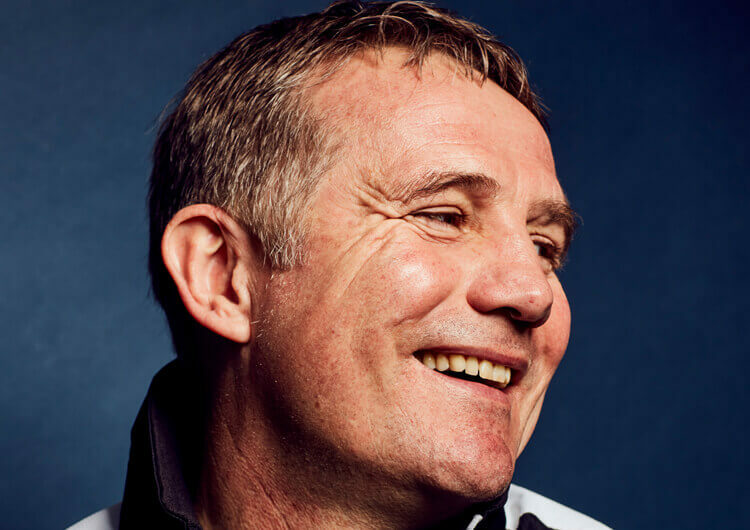 When they did manage anything remotely resembling good possession, they tried to move the ball to one side of the pitch and use short passes to bring City towards them, before switching the ball out to the far side for the full-back and wide attacker to combine.  Rarely did they create the quality of chance to trouble Ederson in the home goal, however – they failed to register even a consolation on a very poor day. Out of possession, the visitors operated in a 4-1-4-1 and would look to press City high. 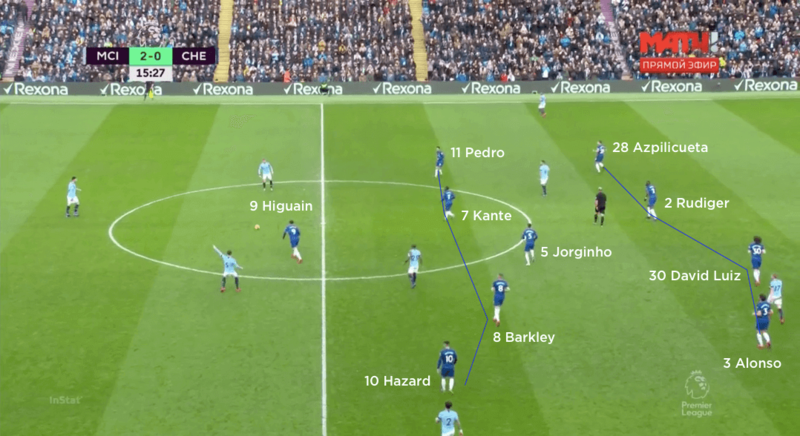 They initially had issues dealing with Fernandinho when City played out, as Higuain and one of Barkley or Kante would be more focused on pressing the centre-back in possession and the goalkeeper – so City regularly found Fernandinho with simple passes through. Once Chelsea started screening or marking Fernandinho, the problem then became dealing with the attacking midfielders in front of him. 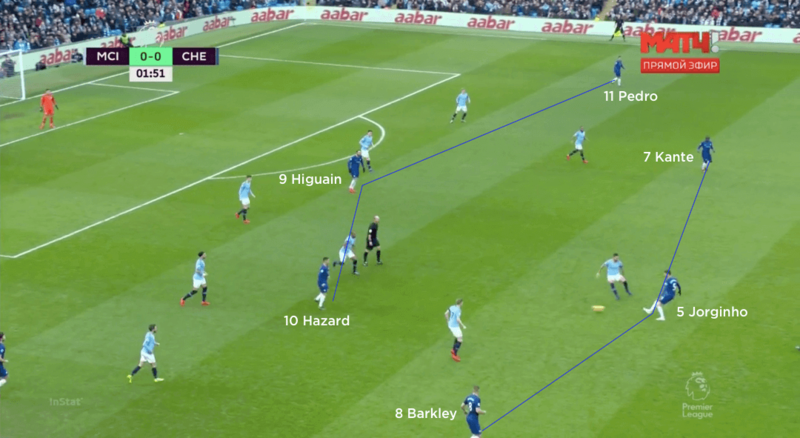 Chelsea’s solution was to utilise Hazard and Pedro to affect them while Kante and Barkley pressed higher – but then the issue became dealing with the City full-backs, who would be left free. The Blues really struggled to cope with City playing out throughout the game, and never really found a solution that nullified the threats.